Lightly coat a 3-1/2- or 4-quart slow cooker with cooking spray; set aside. In a small saucepan bring apple pie filling to boiling. Stir in cherries. Transfer apple mixture to prepared cooker. In a medium bowl stir together flour, granulated sugar, baking powder, and salt. Add milk and melted butter; stir just until combined. Stir in the 1/2 cup walnuts. Pour and evenly spread batter over apple mixture in cooker, spreading evenly. In the same small saucepan combine apple juice, brown sugar, and the 1 tablespoon butter. Bring to boiling. Boil gently, uncovered, for 2 minutes. Carefully pour apple juice mixture over mixture in cooker. Cover and cook on high-heat setting for 2 to 2-1/2 hours or until a wooden toothpick inserted near center of cake comes out clean. Remove crockery liner from cooker, if possible, or turn off cooker. Cool, uncovered, for 30 to 45 minutes. To serve, spoon warm cake and its sauce into dessert dishes. 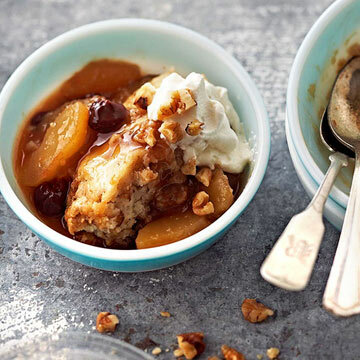 If desired, top each serving with Sweetened Whipped Cream and additional walnuts. For easy cleanup: Line your slow cooker with a disposable slow cooker liner. Add ingredients as directed in recipe. Once your cake is finished cooking, spoon it out of your slow cooker. Once the food is out of your slow cooker liner, simply dispose of the liner. Note: Do not lift or transport the disposable liner with food inside. In a chilled small mixing bowl combine whipping cream, sugar, and vanilla. Beat with the chilled beaters of an electric mixer on medium to high speed just until stiff peaks form (tips stand straight). Do not overbeat.